One of the more unique things to do while in St Thomas, USVI is heading over to Water Island to Heidi's Honeymoon Grill, and enjoy a movie directly on the beach. 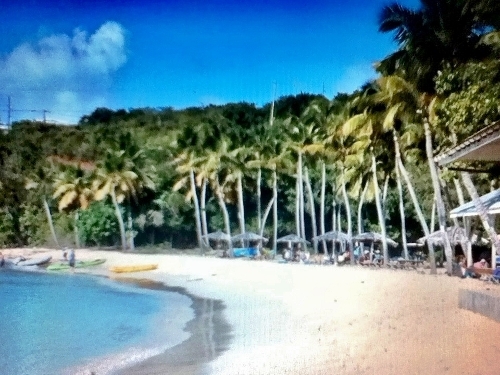 Heidi's is located directly on Honeymoon Beach - beautiful white sand lined with palm trees, and small umbrella huts. The water is clear and calm, with a gradual slope into deeper water. Getting to Water Island from St Thomas is easy, and the trip is under 15 minutes each way. Catch the ferry at Crown Bay Marina, or you can opt for a catamaran trip which includes drinks along the way, and included in the price are a choice of either hot dogs, pizza, or cheeseburger and popcorn once you arrive at Heidi's Grill. 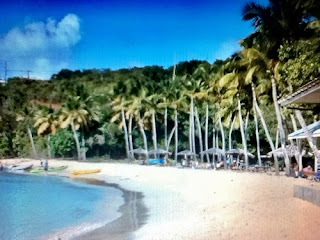 Take an earlier ferry is you want to spend time on the beach, and investigate the smallest of the four USVI islands. If you want to time your arrival closer to movie time, catch the 5 or 6 pm ferry. The movie beach setup consists of a sail suspended between the coconut trees. A generator is used to power the equipments, and after dark the movie starts. Chairs are provided, however depending on the crowd, it's advisable to bring along a towel in case all the chairs are occupied. Water Island is the newest Virgin Island, and received its legal status in 1966. The population is less than 200 residents, and there are NO taxis, public transportation, gas stations, shops or even hotels. Residents make the quick trip to St Thomas for groceries, mail and all other supplies. Next time you visit St Thomas, enjoy a Monday night movie under the moon and stars, with the soft sand underneath your feet! And view one of those fabulous Caribbean sunsets!